I am using whole to make large Egg cutlet/ dimer cutlet. But you can cut the egg to make your preferable size or shape of Egg cutlet. I prefer to keep the whole egg and fry in it cut from centre. If you want, you can use half or quarter of egg. 1. Heat the pan and fry the dry chillies and keep aside. 2. Fry the onion in same oil till it becomes golden brown. Remove fried fried onion from oil. 3. Mash the potatoes with fried chilli, fried onion, pepper, roasted cumin and salt. Mix well. 4. Divide the potato mix into 8 and wrap around each egg with it. Shape it the way you like. 5. Beat the egg and pinch of salt. 6. 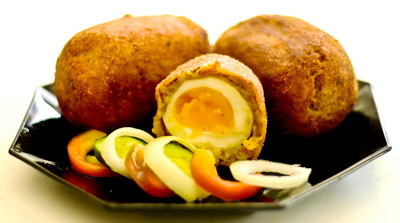 Deep the egg ball into egg batter and coat wit with bread crumbs. 7. Deep fry it till it becomes golden brown. If you want , you can cut egg cutlet/ dimer cutlet from center. 8. Serve hot Egg Cutlet/ Dimer cutlet with rice or as a snack along with onion sliced and cucumber. Keep on eye. I will try.. I am wondering what sort of breadcrumb you use? Packet ones from the store or home made. If packet ones, which brand should I buy? Thank you. Hi, I think for this one that I used packet breadcrumbs.Sorry I cant remember the brand. Any freshly opened breadcrumbs will do.